If you play video games, you've probably heard of League of Legends. League is a free to play game developed by Riot Games, and is currently the most popular game in the world with millions of players logging in daily to duke it out with one another on Summoner's Rift. League of Legends has the largest esports scene of any game, and when the 2016 World Championships took place at the Staples Center in Los Angeles, the event sold out in an hour. 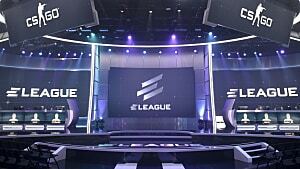 League can be somewhat daunting if you've never played it or any other kind of MOBA before. 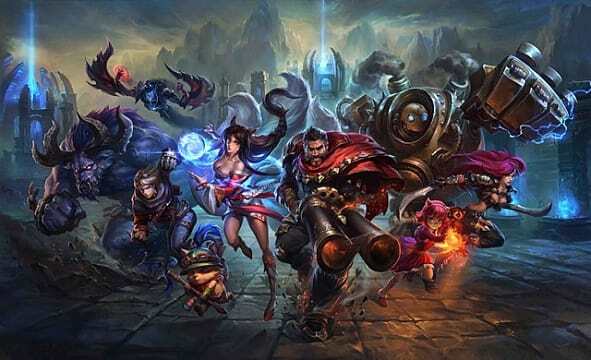 There is a lot that goes into MOBA's, but with this beginners guide you should feel a little less lost when you decide to check out League for the first time. MOBA stands for Multiplayer Online Battle Arena. A MOBA is a game where a team of players who each control one specific character battle one another in order to destroy their opponent's main fortress. The first MOBA was Defense of the Ancients, or DOTA, which started out as a modification for Warcraft III. 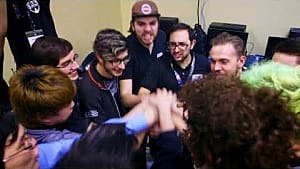 In League of Legends you control one of 123 different champions, and try to work with your team of 5 in order to destroy the opposing team's base. Your character will level up from 1 to 18 depending on how long the game goes. In order to earn experience you can kill enemy players, farm minions, and destroy buildings, all of which we'll get to later. Seems simple right? Well, in theory it is simple, but there are a huge amount of factors that determine how a game of League plays out. We'll get into the nitty-gritty in a bit, but first let's talk about the map. 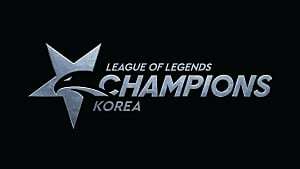 Summoner's Rift is the main map that is played in League of Legends. There is another, smaller map called the Howling Abyss, but Summoner's Rift is where 99% of League of Legends games take place. The map is split into two sides that mirror one another. Each side has a Nexus which is what one must destroy in order to win the game, three rows of turrets which are destroyed in order to advance further into the enemy's base, and a jungle that is filled with neutral monsters that can be killed for money and experience. 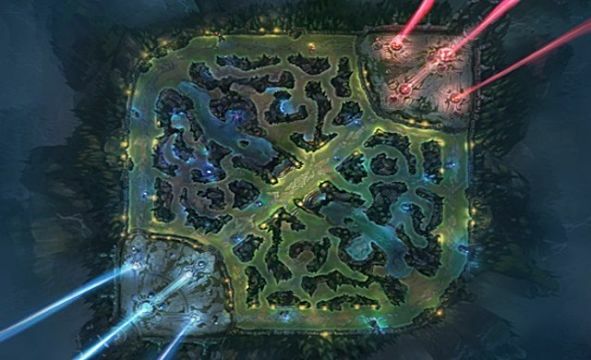 Summoner's Rift's two halves are split in two by a river which is home to the 2 large monsters which serve as team objectives. Three lanes travel continually from one Nexus to the other. The three lanes are where the game will always start out for four of the players on each side. The position you are playing for your team determines which lane you will be in. NPC's called "creeps" spawn in waves from the Nexus and travel in a straight line down each lane. When the creeps from each nexus meet each other they will fight without interruption until one side is gone, and then keep moving forward. The creeps will continually spawn until the Nexus is destroyed. Each champion has 4 abilities. There are some champions who have a stance changing ability which allows them to have 6 different skills, but they'll become self explanatory once you understand the basic 4 abilities structure. At level 1 you can choose from your first three abilities, either Q, W, or E. Each of these will have its own purpose to your champions design, and after you level up all three you can start putting more ranks into each to make them stronger. Some abilities need to only be leveled up once to be effective, and it is more economical to put ranks into the others. 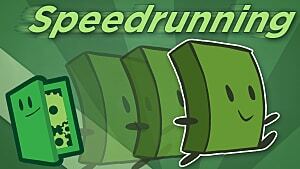 Once you reach level 6 you will gain access to your ultimate ability which is located on the R button. Every ultimate is a potentially game changing skill that has to be used at the right time to be effective. Players will also choose two Summoner's Spells before the game starts. Summoner's spells are abilities with very long cooldowns that are generally used for extra movement or combat purposes. When you start out leveling an account for League of Legends you won't have access to the all important Flash spell. Flash is undoubtedly the most versatile and important Summoner Spell in League. It is a medium ranged blink that lets you pass through any type of terrain, and can be used as a gap closer, escape, flanking maneuver, and many other things. There are 123 champions in League, and they each have their own skillsets and niches to fill in the game. 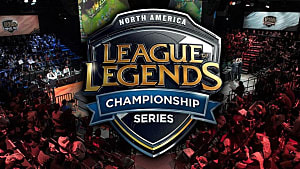 Riot has offered six "Classes" to help define the roles played by each champion on League. Tanks are there to take a bunch of damage and lock people down. Tanks usually don't put out too much hurt, but they are invaluable to a team which needs a specific person kept alive, or a specific opponent away from the team. Fighters are melee damage dealers who are usually a little more beefy than their assassin counterparts. Fighters tend to do decent damage, not have much in the way of movement abilities, and survive in fights for a bit longer depending on their items. Assassins are the characters that you play if you want to style on people. Assassins are all about high risk, high reward situations, weaving in and out of other players in order to find the perfect moment to unleash their damage. Assassins usually do a lot of damage to a single target, but are quite easy to kill if caught. Mages are characters that rely on their abilities in order to do damage. Usually played in the mid lane, mages are desireable for their ability to kill large amounts of creeps in a small amount of time, and their area of effect damage. Mages are usually pretty easy to kill, so it is best to stay at a distance and sling your spells when the opportunity presents itself. Controllers are usually champions whose abilities almost all revolve around keeping enemy champions in place. A control character will be able to manipulate where their enemies move, or don't move. Controllers are usually played in the bottom lane or mid lane. Marksmen or Attack Damage Carrys are the mad scientists of League of Legends. They spend the whole game building up their arsenal of awesome items to do a huge amount of damage, and cackle with glee as their enemies melt in front of their eyes. Be careful though, as Marksmen are very easy to kill, and are prime targets for the enemy team. You will get chased, dove, run over, and melted, but that's just part of being a Marksman. 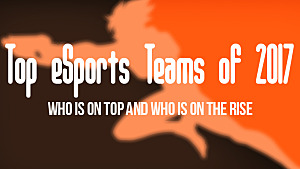 There are 5 different positions in League of Legends that each serve a different role for the team. Top laners spend a lot of time alone up at the highest part of the map. 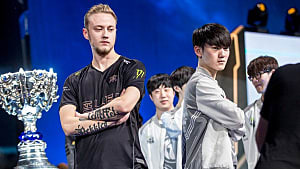 Usually a top laner will play some kind of character that is good at absorbing damage for their team, and has abilities which allow them to pin enemy champions down. The Jungler is the only position that doesn't spend the beginning of the game in a lane. Junglers run around the middle areas of the map between the lanes and kill the independent monsters that populate the areas in between the lanes. A Jungler's main role in League of Legends is to "gank" for their teammates. Ganking consists of trying to sneak up on one of your enemies while they are occupied with your teammate, and force an 2v1 situation where hopefully you can net a kill. Mid laners are arguably the most important position in League of Legends. If you want to deal damage and have a high impact on a game, mid-lane might be for you. Mid lane is where the spellcasters of League are usually played, but characters who are described as assassins also make appearances once and awhile. ADC, or Attack Damage Carry, start out in the bottom lane. ADC's are ranged champions whose main priority is to dish out consistant damage at a safe range. ADC's take a long time to ramp up, so during the early stages of a game, they will have a Support accompanying them to ensure that they don't get destroyed and become useless. Support is the most under appreciated position in League of Legends. A Support's job is to keep the ADC alive in the early stages of the game, and then keep everyone alive during the later stages. Support's are usually either a champion that can take a lot of damage and keep people from jumping on their ADC, or a champion that has longer range so they can stay back with their lane buddy. League of Legends is all about making money. While the end-goal of the game is to destroy the enemy team's Nexus, in order to do that you have to make enough money to buy the items that are needed to defeat your opponents. The easiest way to make money in League is by killing those NPCs called creeps that spawn from the Nexus. When you kill a creep by hitting it for the last bit of damage, a small amount of money will pop up over it's head. Killing creeps is great, but a lot of the time you will have to maneuver around your lane opponents in order to get your last hits in, which bring us to our next way to make bank in League, by killing the enemy team. When you kill a player on the enemy team, you get 300 gold. If it's the first death of the game, or First Blood, you get 400. These amounts are a good deal steeper than the 15 or 20 you get from killing creeps. While killing the enemy team is great, you have to realize that they don't want you to get that 300 gold, and want the 300 that comes from killing you, so you have to pick your battles. One of the hardest things to learn in League is patience. It's not always a good idea to chase down that person that is only one hit away from death, because their whole team might be right behind them to run you over. You can also make money by killing the turrets that sit in three rows. Each turret gives you 250 gold for killing it, and opens up a bit more of the map for your team to maneuver around. A large creature called Baron Nashor who sits in the river gives 300 gold to each member of the team who slays him. Baron spawns at 20 minutes into the game, but is very hard to kill. I put so much emphasis on this because Baron can be a trap for newer players. If you try to kill Baron and the enemy team is still alive, they're going to come kill you, steal Baron, and you're probably going to lose, so while Baron is great to have, you only want to go for him if you're guaranteed to secure him. "So what do I do with all this money now? ", you might be asking. The answer to that is buy items. 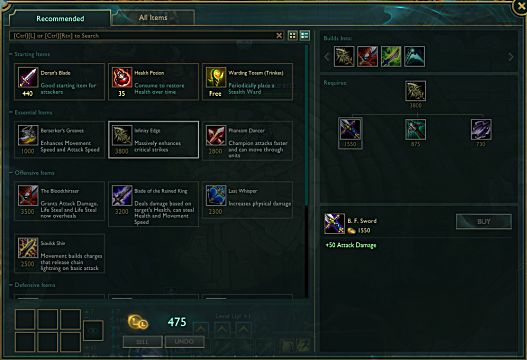 Items are what make your champion stronger, and better suited to defeating the enemy team. At each team's Nexus is a shopkeeper that sells every item available in League of Legends. You may have heard about secret shops in other MOBAs, but there isn't anything like that in League. Each item in the shop is made up of components that must be purchased in order to finish the desired item. Once you have all of the components and the recipe money, you can finish your items and go on your merry way slinging spells and smacking fools down. I won't go into too much detail about items, because that could make up a guide in of itself, but generally items in League will make you do more damage, make you harder to kill, or help your teammates out. They can also do a combination of these things. 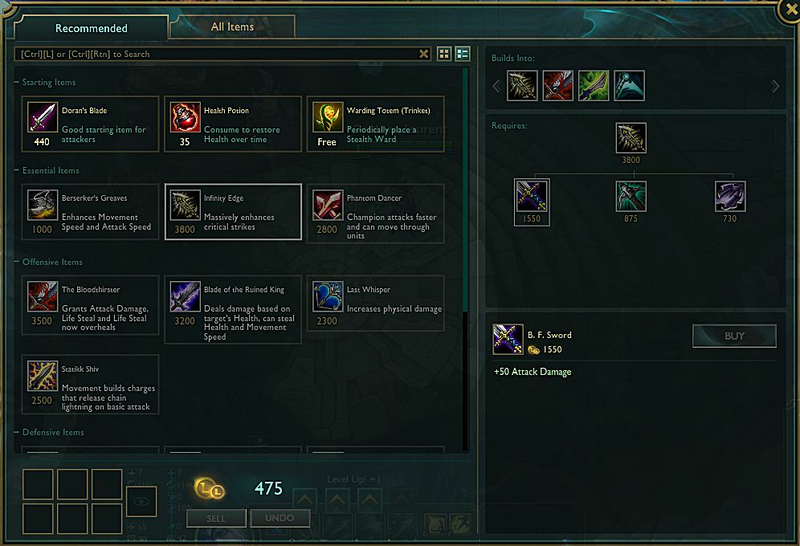 Each champion has a recommended items page when you open the shop, and you should stick with those for awhile until you learn more about what they all do. That's just the super, and I mean suuuuuuuuuuper, basic rundown of how League works. If you're interested in the game you can download it for free off of Riot's website. The best way to learn is by playing, but be forewarned, if you end up liking this game, you will spend a lot, and i mean A LOT, of time playing it. Generally each game of League of Legends takes at least 20 minutes, so if you don't have the time or patience to commit to something like that you might want to steer clear.